Today was my second consecutive day of shopping for holiday gifts. I'm making very good progress between in-town and in-ternet sources. I'll conduct a detailed inventory tomorrow morning (off-blog) to make sure the list has been checked twice. I avoided Black Friday and my shopping experiences yesterday and today were pretty good. I shopped Hilldale Mall on Friday and while it was busy it wasn't horrible. Today I avoided the malls and just hit Target, Michael's (crafts), the Poynette BP gas station, and Poynette's Piggly Wiggly. I left the house about 10:45 am this morning and made it back about 5 pm. I decided to have a bit of a snack before dinner since I, surprisingly, forgot to eat lunch today. (Don't worry, I did eat breakfast.) 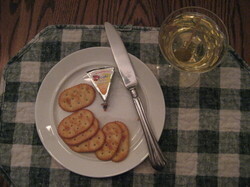 My snack consisted of little mini-Moo wedge (french onion flavor), Townhouse crackers, and a dirty manzanilla sherry martini. The 'martini' is Spanish manzanilla dry sherry with a green olive and a bit of juice from the olive jar. There has been knitting progress. Friday was also oil-change day for the Jeep so I had time to knit at the dealership on the second fingerless mitt. 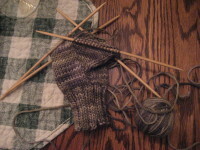 I'm pretty happy with the first mitt, too, which happens to have my first "thumb" construction. Here is mitt number one pointing out the line of snow heading for Chez Purling Oaks. The forecasts vary in how much snow we'll see by the end of tomorrow...anywhere from one inch to three inches. My DSIL, Anne, told me this evening about a method used to reinforce sock heels. She is reading (Anne, I cannot remember the book's title) a historical novel/biography/story about a young woman. In the story, the young woman is knitting socks and there is one line in the book that is very interesting. The line mentions the young woman taking several strands of her own hair to reinforce the heels of the socks she is knitting. I need to follow up with Anne to get the title of the book. Yesterday's snowfall was a pretty respectable five inches with sleet and freezing rain at the end. Respectable, as in, respect the weather! The snow was very heavy and wet. There were numerous accidents. Our driveway is so long we have it plowed and our plow-guy couldn't make it here until about 10 AM since the township roads were very slippery and unplowed. Whew. I'm glad both DH and I were home and not out in the storm. 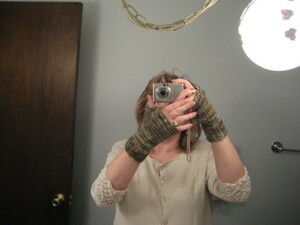 I cast on for fingerless mitts last night with Koigu yarn from Kim. 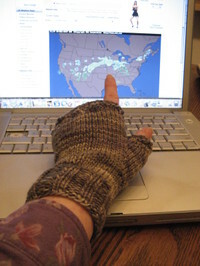 I admired her mitts and, due to her giftiness, I can knit some too. The yarn is shades of olive green. I meant to cast on for Williamsro but the Koigu was calling out for attention. Thank you, Kim! Today, I spent time on laundry as usual. It is my favorite chore but the key word is chore. 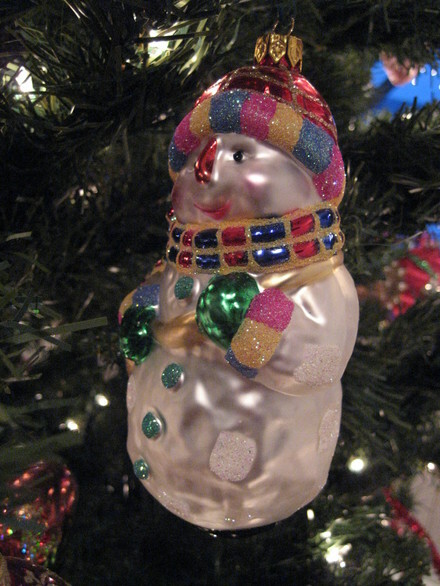 I also decorated for Christmas.....including putting up the tree. We have a *fake* tree. It is very convenient and since it is pre-lit, quite handy. Real trees are great but they are more hassle than I want due to our schedule. 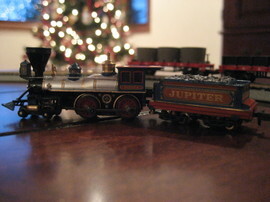 One of my favorite parts of our Christmas decorations is the train.